An accident at work can be caused by any number of instances; perhaps by the use of faulty machinery, or being made to utilise unsafe working conditions. Negligence or carelessness on the part of your employer can cause an accident at work, and whether it was a burn, a cut, or even a trip, slip or fall, there can be no doubt that this was not your fault. Any of these accidents at work can result in a physical injury. 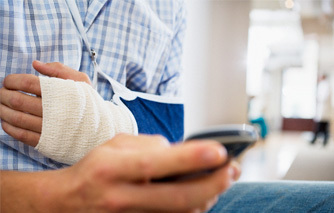 These injuries can have consequences ranging from minor to very serious. In particular, head injuries or joint problems caused in these cases can have medical repercussions lasting a long time into the future, and can cause you extreme emotional distress. In these cases it is more than reasonable and fair for you to expect financial compensation for your accident at work. This will at least go some way to covering medical costs you've incurred, and possible loss of earnings you've suffered from having to miss work. When you contact Simple Justice, you're putting your case in the hands of expert accident at work legal service providers. We've been established for twelve years, and have already given many clients the peace of mind they deserve by claiming for them the accident at work compensation they're entitled to. If you fill in our online form a team member will contact you at a time that's convenient, or alternatively you can speak to us on our free phone number at 0800 567 7072. Simple Justice are ready to take your call twenty four hours a day, seven days a week. Call now to find out about our No Win, No Fee Services.